Natural Stones are quarried out of mountains or underground from all over the world and then cut into blocks. The various sized stone blocks are then transported to the cutting and finishing plants where the stones are cut into various sizes and shapes and then the face is finished into a polished, honed, flamed, brushed, hammered, etc. based on the customer’s specifications. One beautiful characteristic of natural stone is that there are no two pieces of natural stone alike. Some stones may have extreme variation in color and veining from tile to tile or slab to slab. This characteristic is common in many types of stone, and is part of the inherent beauty of using a natural product in your home or project. GROUP A: Sound marbles with uniform and favorable working qualities; containing no geological flaws or voids. GROUP B: Marbles are similar in character to the proceeding group, but with less favorable working qualities; may have natural faults; a limited amount of whizzing, sticking and filling may be required. GROUP C: Marbles with some variations in working qualities: geological flaws, voids, veins and lines of separation are common. It is standard to repair these variations by one or more of several methods–whizzing, sticking, filling or cementing. Liners and other forms of reinforcement are used when necessary. GROUP D: Marbles similar to the preceding group, but containing a larger proportion of natural faults, maximum variations in working qualities, and requiring more of the same methods of finishing. This group compromises many of the highly colored marbles prized for their decorative values. The Soundness Classifications merely indicate what method and amount of repair and fabrication is necessary prior or during installation, as based on standard trade practices. Although granite has been known as igneous rocks derived from, molten masses or magmas, but there is wide evidence that the origin of some granite may be attributed to regional metamorphism or preexisting rocks, rearrangement and recrystallization taking place without a liquid or molten stage. The specific gravity of granite ranges from 2.63 to 2.75. Its crushing strength is from 1050 to 14,000 kg per sq cm (15,000 to 20,000 lb per sq in). Granite has greater strength than sandstone, limestone, and marble and is correspondingly more difficult to quarry. It is an important building stone, the best grades being extremely resistant to weathering. FINE GRAIN: Fine grain granites are those which the feldspar crystals average about 1/16 – 1/8″ in diameter. MEDIUM GRAIN: Medium grain granites are those in which the feldspar crystals average about 1/4″ in diameter. COARSE GRAIN: Coarse grain granites are those in which feldspar crystals average 1/2″ , and greater diameter or several centimeters in maximum dimension. Coarse grain granites may have a lower density. In recent years about 83 percent of the stone used for monuments has been granite, about 17 percent, marble. Travertine stone is soft and delicate to look at. It breathes spaciousness. It’s relaxed and soothing. The feeling is peaceful, tranquil, serene. It’s a simple beauty. A casual formalness. The classic aged look of tumbled stone will warm your home. A polished or honed travertine becomes a bit more formal, yet it’s still inviting. The soft earthy hues of this natural stone keep it in tune with nature. 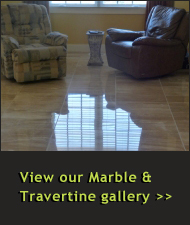 Travertine stone is a form of limestone. It often forms near hot bubbly mineral rich springs. Gas bubbles become trapped and create a pitted surface on the stone. These pitted surfaces can be filled with an epoxy or dust resin. Filling the small holes and pits gives the travertine a more finished look. A refined beauty. The stone surface can be left in its natural state with the small holes and pits unfilled. This is a warmer aged look which will acquire a beautiful patina over time. Leaving the stone unfilled will affect the durability. It will attract dirt much easier than a filled travertine making it harder to keep clean. This is a calcareous stone. It is will react negatively to acids found in common household items such as lemons, vinegar, alcohol and some cleaning products. These acids will etch the stone by leaving marks, rings or dull spots. Similar to limestone, travertine also varies in hardness, density, and porosity. Some travertine stones are harder than others. Although the hardness varies, it will still scratch. It’s not as soft as soapstone but it can’t compete with the hardness of granite. You can always test a sample stone by running a sharp blade across the top or even tossing your keys on it a few times. What about colors? Travertine colors are in warm earthy tones. From the softest ivories to the palest creams. Rich shades of golden honey and silvery greens to deep mocha browns. Travertine never appears as one solid color. The color tones vary and veins or bands of contrasting color run throughout the stone. No two stones or tiles are alike. The shale from which slate originate were deposited previously on clay beds. Subsequent earth movements tilted these beds of shale, at first horizontal, and the intense metamorphism that converted these into slates folded and contracted them. Slate, then , belongs to the metamorphic group of rocks and can be defined as a fine grain rock derived from clays and shale and possessing a cleavage that permits it to be split into thin sheets. INTERIOR use only slates are designates with an “I” or “interior” on specification sheets. EXTERIOR use is labels as either “E” or “exterior” on specification sheets. Quartzite, common and widely distributed rock composed mainly or entirely of quartz. The compact, granular rock is a form of metamorphosed sandstone in which silica, or quartz, has been deposited between the grains of quartz of which the sandstone is essentially composed. Other minerals that may be present in small amounts in quartzite include feldspar, mica, rutile, tourmaline, and zircon. Quartzite has a smooth fracture and is found primarily among ancient rocks, such as those of the Cambrian or Precambrian system. Call us Today at (812) 491-8453.